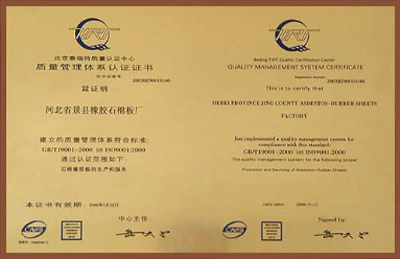 11YRSHengshui Aohong Technology Co., Ltd.
Hengshui Aohong Technology Co., Ltd. is an industrial company with an integration of industrial production and trade. It's a subsidiary of Aohong Group Ltd. (www.cn-aohong.com).Our company was incorporated by Hebei Fuyuan Sealing Material Factory (www.cn-sealings.com), Hebei Aohong Level Gauge Glass (borosilicate) Factory, Hebei Bright Pearl Wire Mesh Factory (www.wiremeshchina.net) with capital of USD5,350,000. On the other hand, we have partnership company in Moscow, the website is www.rus-kit.ru, we have partnership company in Bangladesh (trade resources Add: Hazi Nazu Meah Market, Boxirhat East, Chittagong-4000, Bangladesh. Tel: 880-31-614308 / 656938 E-Fax: 001-270-716-3946 Mr. Hossain.Our company specializes in producing sealings gasket sheets,thermal insulation cloths, rope, tape, level gauge glasses (plane, reflex),rubber hose,etc.All of our products sell well in both domestic and international markets.Our company has independent import and export rights. "Creditability and sincerity" is our business principle. Now, our products are exported to Ukraine, Russia, Egypt, Europe, the Middle East, Canada, America, Australia and South Africa, etc. We are keeping long-term and good relationships with our clients.Please see the following detailed information of our products. We hope we will have good and long-term cooperation.